CONEXPO-CON/AGG is an international exposition where thousands of exhibitors gather to display their products. The show is held every three years and showcases the newest equipment, services, and technologies in the world of construction. This year’s show featured 2,400 exhibitors with products from every major construction industry including concrete, lifting, mining, utilities, and more. There were more than 130,000 attendees ranging from contractors and distributors to service providers and engineers. 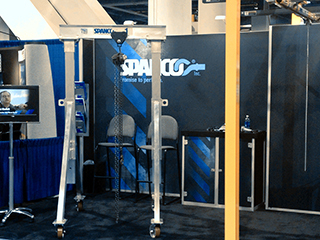 While more than 200 of the show’s exhibitors were displaying products and services related to lifting equipment, Spanco, Inc. was the only overhead crane manufacturer present. In the construction industry, portability is a major factor, which is exactly why we chose to showcase our Aluminum Gantry Cranes. Spanco’s Aluminum Gantry Cranes are popular with contractors who need a mobile material handling system that can be transported easily in a service truck. They are also corrosion resistant, which makes them ideal for HVAC applications, refrigerated areas, clean rooms, and other controlled environments. Best of all, our Aluminum Gantry Cranes are engineered for easy transport and fast assembly. With adjustable spans and heights, Spanco Aluminum Gantries allow workers to lift materials at any job site. Many CONEXPO attendees were interested in using an aluminum gantry to service their own equipment and to provide routine maintenance on trucks, tractors, and other heavy equipment. These lightweight gantries are easily used to move heavy systems like AC units, heaters, and pumps. They provide precise movement in and out of ductwork, and with pneumatic tires, they move easily across uneven surfaces and on rooftops. Aluminum Gantries can also be used to load and unload equipment from service trucks and to lift heavy materials like steel and rebar—right on site. This year’s CONEXPO show was one of the biggest expositions that the construction industry has ever seen. With so many industries under the umbrella of construction, it was important to showcase one of the most versatile pieces of equipment that we manufacture. Our pre-engineered aluminum gantries provide the type of flexibility and portability necessary for most construction applications. But, if you are looking for something customized to meet the exact specifications of your application, look no further. Spanco is a leading manufacturer of gantry cranes, and we specialize in designing customized solutions to meet your material handling needs–both on and off the job site.